2. The John Jones noir dynamic. I recently had the pleasure of reading all three of the available trades of Matt Wagner and Amy Reeder Hadley's Madame Xanadu. What a treat. More on that series later, but for now, let's just say I was overwhelmingly surprised to see a Silver Age John Johns running around solving mysteries. Now, I'll take a John Jones cameo. He showed up for a panel or two in DC Universe Legacies and that made me happy. Well, to see the character actually understood and used as he should be by Matt Wager was downright mind-blowing. "Mr. Jones" shows up during the 1950's to help Madame Xanadu to solve a case they are both working on. 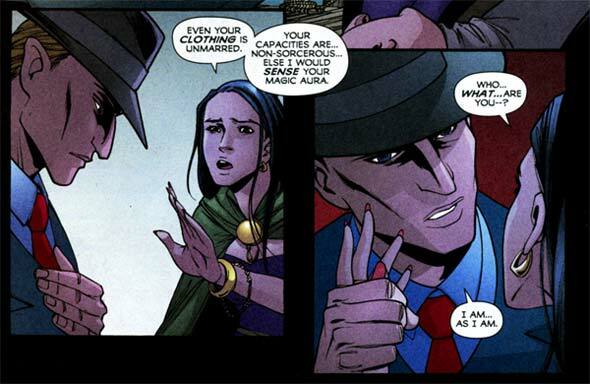 He came off so mysterious and full of intrigue that Madame Xanadu at first mistook him for the Phantom Stranger. Though never revealed his true identity, several hints were laid down in just the right spots. The end effect was that of an implacable character closely guarding his own secrets and though rent down to his core by his vulnerabilities, still saw to the needs of others over his own safety. And if it were Popeye helping her? "I yam as I yam!" Geez, that was bad. Even for me. What I just described up there could easily be a noir protagonist. 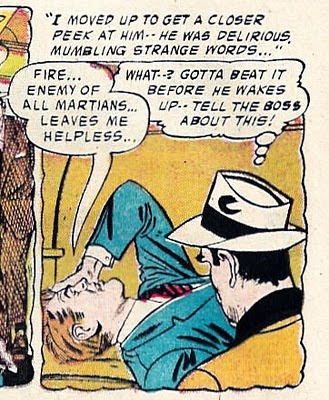 While the mystery is generated here becuase Jones is seen from an outside perspective, in the right hands, the same dynamic could be translated to a story seen from J'onn's point-of-view. It's the setting, really, that makes this all work. All that needs to be done to achieve this dynamic is bring J'onn back to the 50's and surround him with humans. Having a secret = instant tension. Tension = suspense = a good story. While death is treated as a joke in the comics world, having one's secret identity revealed is a real game changer. And when a character has to act despite the risk of losing something, well, that makes the story even better. It's just one more vulnerability for a character defined by his weaknesses. If everyone around you could potentially blow your cover and cause you to lose your job or your good standing in society, everyday life would be like venturing out into a mine field. It makes J'onn's current "plight" in Brightest Day about as exciting as reading about someone walking through the park. See? That tension showed actually up in the Silver Age, too. Me, I'll take a mine field over the park any day when it comes to fiction. ..but when it comes to me actually walking in a park, I prefer mine mineless. Anyway, loved that cameo up there! lol! Yeah, sending out a minesweeper ahead of you does tend to ruin a nice Sunday stroll in the park. I hope a good Martian Manhunter solo series (or even a miniseries) comes to fruition soon. We can only hope! Okay, so which of these trades does John actually make substantial appearances in? M.C. has been talking them up for a while, but he read them as floppies. I suspect "I Am As I Am" is a play on the Jewish name for G-D, based on the response they received to the same question in the Tanakh. Frank, all of "John Jones"'s appearances are in the third volume, which takes place in the 50's. I'd recommend reading the first volume as well, as there's some good writing and solid art in that volume. And if you like the Phantom Stranger, he's a main player in volume one. Volume two was a little slower paced and featured a different artist. A new John Jones book wouldn't have to take place in the '50s, and he wouldn't have to wear a hat (although it wouldn't hurt if he did), but making him an implacable hunter of evil-doers with a strange secret is a good idea. Each story could be told from the point of view of one of the human participants -- Jones' client, the bad guy, a bystander, whoever -- so that we always see him through human eyes. Either that, or send him to the 30th century and make him the leader of a new Legion of Substitute Heroes, written by Keith Giffen.